Make a turtle at The Kids film lounge with fellow Scribble Akiko this Saturday at CentrE17. 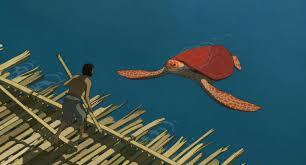 The Red Turtle is the tale of a man who is stranded on a desert island during a storm. His desperate attempts to escape, by lashing together bamboo canes to form a raft, are repeatedly thwarted by some unseen undersea force that shatters his vessel. On his third attempt, the man comes face to face with his saboteur, a giant red turtle who in turn recounts the milestones in the life of a human being. This film adds to Studio Ghibli's estimable legacy with a beautifully animated effort whose deceptively simple story boasts narrative layers as richly absorbing as its sumptuous visuals, and replacing dialogue with a soaring soundtrack.